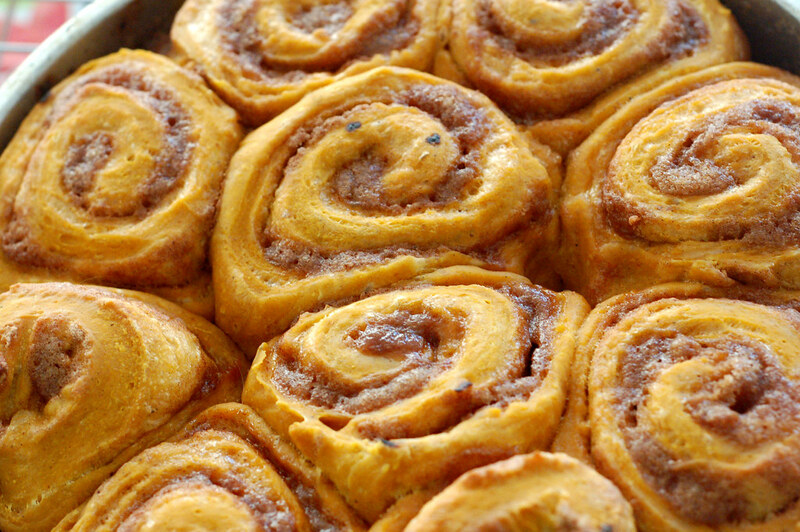 With fall quickly approaching, these yummy-to-your-tummy Pumpkin cinnamon rolls are the perfect addition to your breakfast menu. To prepare the buns, dissolve yeast in warm water in a large bowl; let stand for 5 minutes. Lightly spoon flour into dry measuring cups, and level with a knife. Add 2 cups flour, pumpkin, and next 5 ingredients (pumpkin through nutmeg); beat with a mixer at medium speed until smooth. Turn dough out onto a floured surface. Knead until smooth and elastic (about 10 minutes); add enough of the remaining 3/4 cup flour, 1 tablespoon at a time, to prevent dough from sticking to hands (dough will feel tacky). Punch dough down; cover and let rest for 5 minutes. Roll the dough into a 12 x 10-inch rectangle on a floured surface. Spread the 1/2 cup softened butter on the dough evenly. Sprinkle with brown sugar mixture. Roll up the rectangle tightly, starting with a long edge, pressing firmly to eliminate air pockets; pinch seam and ends to seal. Cut roll into 12 (1-inch) slices. Place slices in a 9-inch square baking pan coated with cooking spray. Cover and let rise 25 minutes or until doubled in size. Preheat oven to 375°.Bake the rolls for 20 minutes or until golden brown. Cool for 15 minutes in pan on a wire rack.